Election after election, it’s the 50+ population that reliably turns out to vote and is crucial in deciding who serves in the Texas Legislature. So, as I see it, what these citizens have to say about the issues of the day should command sincere attention during the 2015 legislative session. In fact, I think putting their concerns at the forefront is key to making this a great legislative session for Texas. There’s a lot on the minds of Texans age 50 and up. But much of what they want the Legislature to accomplish is in sync with the stated goals of legislative leaders and our new governor. This year, there’s broad support for action on issues related to caregiving, nursing home quality, surprise medical billing, retirement security, as well as reforms related to guardianship powers and predatory payday lending. Folks all over the state are telling us they see urgency to these issues that AARP volunteers and staff are discussing with legislators. Take the topic of surprise medical billing. We’ve heard so many stories of people getting a nasty surprise after a hospital stay or other medical treatment. Often, patients are in health plans with networks of doctors, hospitals and other health care providers who have agreed with an insurer to provide services at agreed rates. The problem is that not all of the doctors and other providers who work at the facility at which they’re treated are bound to that agreement. The result for the patient can sometimes be a surprise bill, and in Texas, consumers currently have few rights to challenge the charges. AARP supports reforms that limit surprise medical billing and that take consumers out of billing disputes between insurers and health care providers. We take great care at AARP to survey opinions, and another thing we know for sure is that the vast majority of older Texans want to live independently at home. Most seniors who receive assistance at home rely exclusively on unpaid family caregivers for help. These caregivers have a huge responsibility, and there are common-sense steps that would make a world of difference to them. To support the more than 3 million family caregivers in Texas, AARP urges lawmakers to enact the Caregiver Advise, Record, Enable (CARE) Act. The proposal aims to ensure that caregivers know what to do to safely look after loved ones when they’re discharged from a hospital. Among other things, the act requires hospitals provide an explanation of medical tasks that a caregiver will perform at home. There’s even more we can do to relieve caregivers. 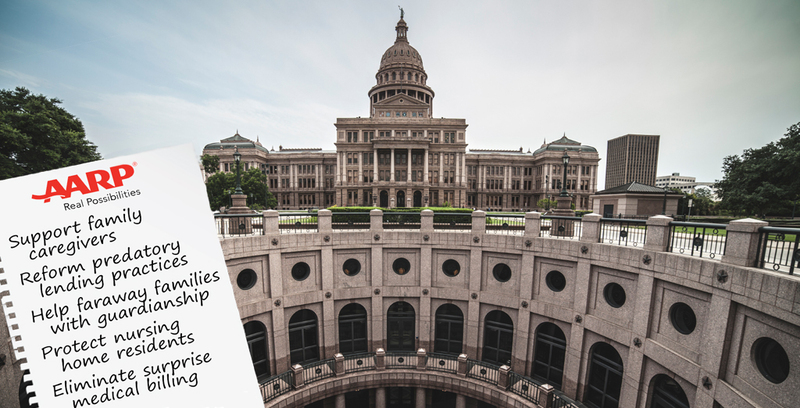 As many Texans already know, when plans are not formally in place for someone’s care, family caregivers—or guardians—can get caught in jurisdictional tangles, especially if crossing state lines is involved. AARP would like Texas legislators this year to approve a set of rules to make it easier for family caregivers. It’s called the Uniform Adult Guardianship and Protective Proceedings Jurisdiction Act. And for those who reside in nursing homes, they should be assured quality living. Unfortunately, reports show that some Texas nursing homes are plagued by high staff turnover, frequently put residents at risk of getting pressure sores, and inappropriately give anti-psychotic medications to their residents. To improve nursing home quality, AARP supports recommendations offered by the Texas Sunset Advisory Commission to impose serious sanctions against nursing homes that have serious and repeat violations. In talking to Texans, I know consumers are tired of getting trapped by the abusive lending practices of payday and auto title lenders who issue loans with APRs of 500 percent or more. While it’s great that most major Texas cities have passed local ordinances regulating payday lending, a statewide solution is needed. AARP supports reasonable and just reform of the industry and I’m hopeful that it comes this year. With 2.2 million members in Texas, AARP staff and volunteers are eager for more conversations with state leaders on these and other topics. AARP is a nonprofit, nonpartisan organization on Twitter at @AARPTX or on Facebook at AARP Texas. AARP can also be reached at their offices in Austin at 866-227-7443.